This soundtrack was made with the bindubba1 sequencer controlling 4 VCOs. The VCOs were connected to VCFs and wave multipliers, all CV'd by the bindubba1 as well. During record I just changed the song sequencing switches and the levels on the mixer. These are protoype PCBs, 9 are available ( now 7?). 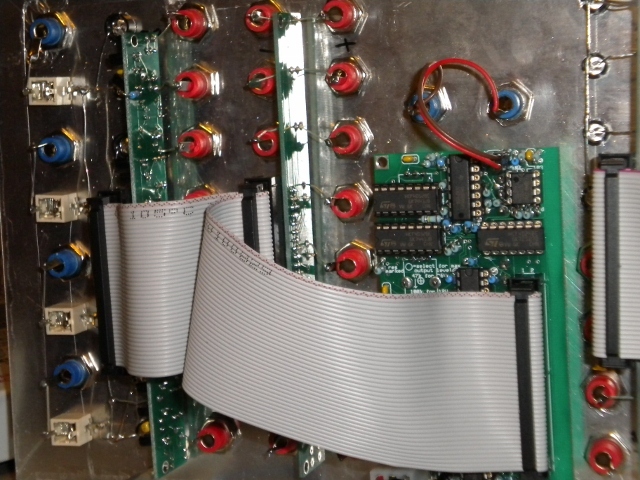 The one above is a bindubba1 shift sequencer. One set of boards is $25 plus shipping. 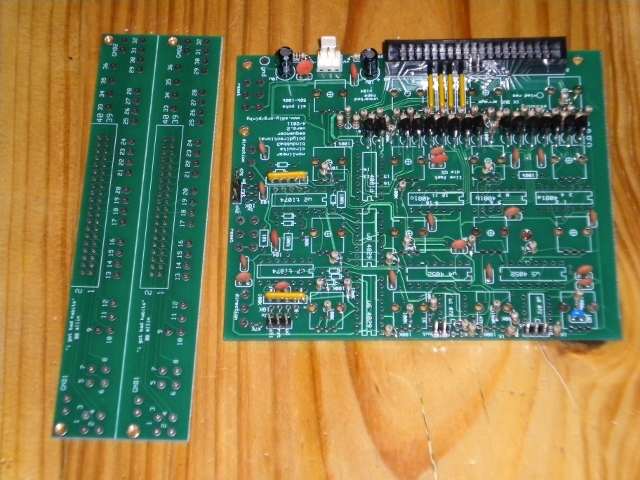 One breakout board is for LEDs and binary count gate outputs, the 2nd is for the 16 control voltage outputs. It is a wonderfully easy sequencer to use, one clock input gives 16 different but related control voltage outputs which can be used for brain-twisting convoluted melodies, the switches can be used for 'song sequencing', plus it gives 8 gate signals which are divisions of the input clock (perfect for driving the bindubba3 - below). The boards are connected by 40 pin IDC cable (same inside your PC = cheap), so wiring is very easy. Building the PCB itself is not so easy, the components are VERY densely packed. Good soldering skills and a fine tipped iron are essential. 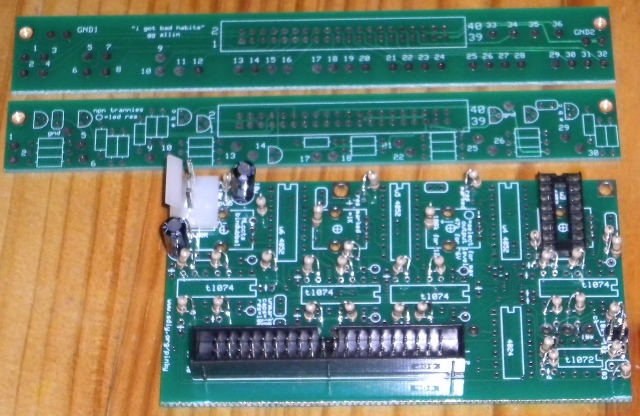 The boards need one mod: cut a trace and add a resistor. It was a problem that didn't show up on the vero-board version. More info on the design and some demos can be found HERE. 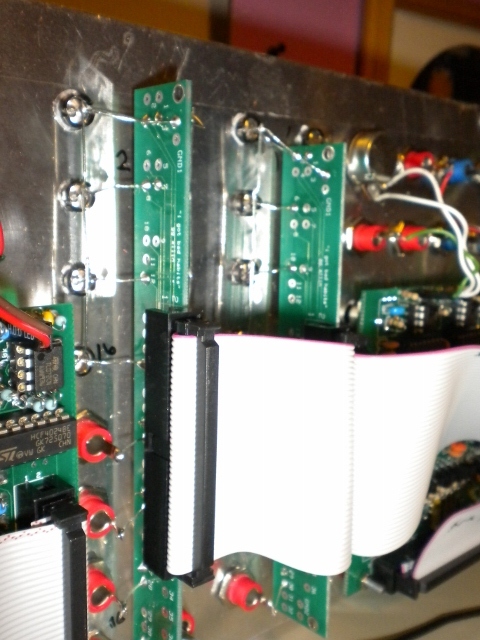 Pots and switches can be mounted on the PCB. The breakout boards are connected to LEDs and jacks by wire clippings. I used clippings from LEDs which are quite stiff and the boards are held on very well with no need for extra mounting. Pictures of the mounted boards at the bottom. 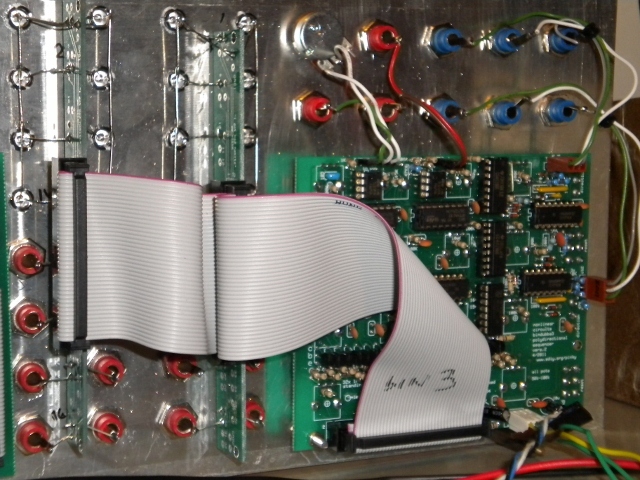 The pictures below show the bindubba3 polydirectional sequencer. These are protoype PCBs, 9 are available (7?). 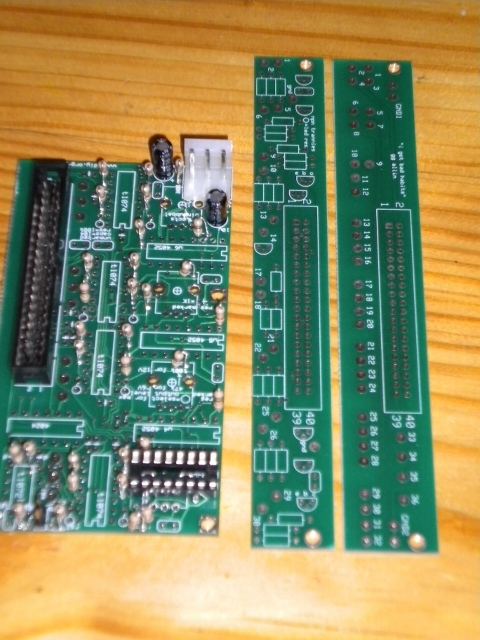 One set of bindubba3 boards is $35 plus shipping. Again pots and switches are mounted on the PCB and some sections are very densely populated, so good soldering skills are essential. This sequencer is really quite fun to use and can be patch-programmed to operate in a variety of different patterns. You can do the old school count up from 1 to 16 if you wish but it can do so much more. More info here The schematic in the link is an early version and will be updated soon. Watch the vid to see the bindubba3 in action, various patterns from different reset programming patches can be seen. 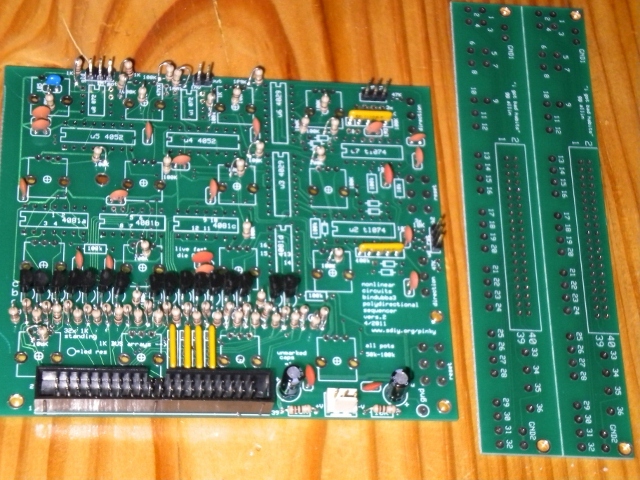 Now the bad news, this board requires a number of mods to get it to work. A minimum, to get it working, is cut one trace, add two jump-wires and 8 resistors...not too difficult. To get full patch-programming functionality it needs another 7 traces cut and about 7 jump-wires added. I go by andrewF on muffwiggler and electro-music and can easily be found on either forum. Discussion of these designs can be found on the muffwiggler DIY forum. 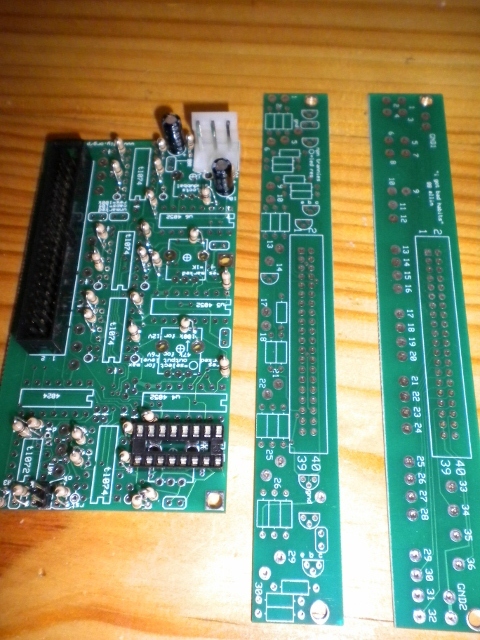 Build info will be provided for those that buy the PCBs.